Do you think that whistleblowers should be protected? Yes, I think that it is very important. The role played by whistleblowers could be seen as public service. We owe a lot to Chelsea Manning. We owe a lot to Edward Snowden. 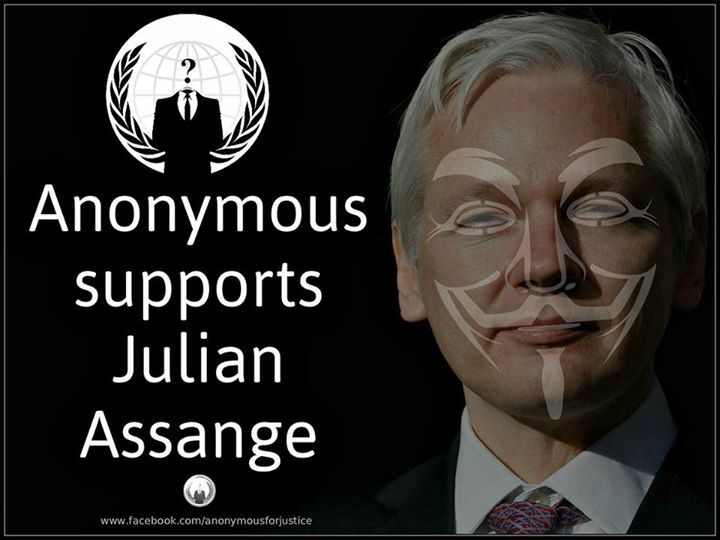 We owe a lot to Assange. We owe a lot to WikiLeaks. And a Wikileaks cable tells the tale, reporting on a meeting between newly installed Acting President Michael Temer and U.S. Embassy officials including political officers [poloffs], a position often used as official cover by agents of the Central Intelligence Agency. Official cover posts come with diplomatic immunity, unlike the more perilous non-official cover [NOC] positions, where work can result in prison and even death sentences. Temer is also named in 21 other cables, including one naming him as one of several conservative legislators caught on camera taking bribes. That cable follows after the jump. We are very suspicious of the legal coup which has unseated progressive President Dilma Rousseff, given the unrelenting opposition of successive administrations to any Latin American government veering slightly to the left. 1. (U) Sensitive but Unclassified – protect accordingly. 2. (SBU) Summary: Federal Deputy Michel Temer, national president of the Brazilian Democratic Movement Party (PMDB), believes that public disillusion with President Lula and the Workers’ Party (PT) provides an opportunity for the PMDB to field its own candidate in the 2006 presidential election. However, party divisions and the lack of a compelling choice as a candidate could force the PMDB into an alliance with Lula’s PT or the opposition PSDB. If Lula’s polling numbers do not improve before the PMDB primaries in March, Temer said his party might nominate its own candidate. This would still allow the party to forge an alliance with the PT or PSDB in a runoff, assuming that the PMDB candidate fails to make the second round. Given its centrist orientation, the PMDB may hold the balance of votes between the two opposing forces. It is also likely to remain a force at the local and state level. Temer believes it has a chance to win as many as 14 gubernatorial races. End Summary. With Allies Like This . . .
3. (SBU) Michel Temer, a Federal deputy from Sao Paulo who served as president of the Chamber of Deputies from 1997 through 2000, met January 9 with CG and poloffs to discuss the current political situation. Lula’s election, he said, had raised great hope among the Brazilian people, but his performance in office has been disappointing. Temer criticized Lula’s narrow vision and his excessive focus on social safety net programs that don’t promote growth or economic development. The PT had campaigned on one program and, once in office, had done the opposite of what it promised, which Temer characterized as electoral fraud. Worse, some PT leaders had stolen state money, not for personal gain, but to expand the party’s power, and had thus fomented a great deal of popular disillusion. 4. (SBU) This reality, Temer continued, opens an opportunity for the PMDB. The party currently holds nine statehouses and has the second-highest number of federal deputies (after the PT), along with a great many mayoralties and city council and state legislative seats. Polls show that voters are tired of both the PT and the main opposition party, the Brazilian Social Democratic Party (PSDB). For example, a recent poll showed former governor (and PMDB state chairman) Orestes Quercia leading in the race for Sao Paulo state governor. 5. (SBU) Asked why the PMDB remains so divided, Temer said the reasons were both historical and related to the nature of Brazilian political parties. The PMDB grew out of the Brazilian Democratic Movement (MDB) under the military dictatorship, which operated as an umbrella group for legitimate opposition to the military dictatorship. After the restoration of democracy, some members left the PMDB to form new parties (such as the PT and PSDB), but many of those who remained now act as power brokers at the local and regional level. Thus the PMDB has no real unifying national identity but rather an umbrella organization for regional “caciques” or bosses. Temer noted that the PMDB is not the only divided party. Although there are 28 political parties in Brazil, most of them do not represent an ideology or a particular line of political thinking that would support a national vision. Is this the next Prime Minister of Iceland? Birgitta Jónsdóttir. member of the Icleandic Althing [parliament] and founder of the Pirate Party. Via Wikipedia. First up, while the media have reported that Iceland’s prime minister has resigned over the offshore banking scandal triggered by the massive leaks of documents from Panamanian law firm Mossack Fonseca, there’s a new twist. Prime Minister Sigmundur David Gunnlaugsson said he was stepping aside following the largest anti-government protests in modern times in Iceland, a sign of the public anger over his family’s offshore holdings. Iceland’s fisheries minister announced that Gunnlaugsson had stepped down, according to state broadcaster RUV. In a statement late Tuesday, Gunnlaugsson’s office said he “has not resigned” and was merely stepping aside “for an unspecified amount of time” and would remain as chairman of his ruling Progressive Party. It said the party’s deputy leader, Sigurdur Ingi Jóhannsson, would take over as prime minister. Whether disgruntled Icelanders would allow Gunnlaugsson to return to the post in the future was far from clear. But if his ouster becomes official, who’s his likely replacement? Enter the poetician. . . Here at esnl, we’ve been longtime fans of Birgitta Jónsdóttir, a poet and artist who cut her political teeth as a high-profile volunteer with Wikileaks, then moved on to electoral politics, forming two political parties and now heading the leading parliamentary power in the parliament that will soon meet to elect a new prime minister. She heads the civil libertarian Pirate Party, one of the two she founded, and calls herself a poetician rather than a politician. It’s fitting that the job is now vacant — ore nearly so — because of another leak, the massive document dump listing the clients of a Panamanian law firm specializing in setting up front to hide plutocratic wealth for government tax collectors. Birgitta Jonsdottir, ex Mullumbimby and Melbourne resident, former colleague of Julian Assange, now official ‘poetician’ for Iceland’s Pirate Party, admits with some surprise that she might be her country’s next prime minister. Ms Jonsdottir, a member of parliament for the Iceland’s Pirate Party, says Mr Gunnlaugsson had taken his colleagues by surprise with his visit to the president. “He had not consulted with anybody and they were like so pissed off,” she said. “They did not conceal it, they were just seething.” They had then forced him to resign, she says. To get an idea of the man whose job she stands to inherit, here’s what hapopened when a Swedish television report held his feet to the fire with questions about those offshore companies incorporated by those Panamanian money hiders. If you’d like to learn more about Jónsdóttir, here’s a link to a TedX talk she delivered last June. Her Twitter account is here. Currently we are experiencing similar events to that which Iceland experienced in the wake of the financial crisis in 2008. And yet we still don’t have a satisfactory system for holding those in power to account—other than standing outside the parliament and screaming it out loud. The constitution we would implement was written by and for the people of Iceland in 2011 in response to the financial meltdown. It would include the separation of powers to prevent another economic collapse, while also reforming the way MPs are elected and judges are appointed. It is completely unacceptable that despite a referendum in 2012 that saw 67 percent of the electorate voting to put this new crowd-sourced constitution into law, it still hasn’t been. It is difficult to say at this stage exactly what the complete ramifications of this scandal are, but it is obvious that our nation’s reputation will be severely damaged abroad, simply because we are the only Western European country with a sitting minister—let alone a prime minister—that has been directly implicated in this scandal. If this was a comedy it would be funny but this is actually our head of state. This is not what Icelanders are like and this is not what Iceland is. Julian Assange, Edward Snowden, and Daniel Ellsberg are all well-known for their revelations of governmental wrongdoing, while William Binney and Thomas Drake are less well known for their exposure of National Security Agency misdeeds. Then there is Annie Machon, who narrowly escaped a British prison cell after her revelations about MI-5, Britain’s domestic security agency. What all have in common is a belief that it was worth risking the threat of prison, or worse, to guarantee that citizens of their countries know the truth about what their governments were doing, both to themselves and others, in the name of national security. What happens when an intelligence insider wants to reveal their country’s surveillance secrets? What about if that secretive culture still affects an individual after they’ve become a whistleblower? Birgitta Jónsdóttir: Headed for Iceland’s top post? esnl‘s long been partial to Birgitta Jónsdóttir, Iceland’s poet, artist, Internet activist, publisher, hacker, and best-known science fiction fan. She came to international prominence as a Wikileaks activist at a time when half the world’s cops and spooks wanted to shut the site down, and her activism led her into the national legislature as a member of the Pirate Party, a movement she helped found. The anger spurring her move into the political arena came from the national government’s capitulation of the banksters who had brought the country to near-ruin. But now she stands on the brink of yet another major change. Birgitta Jónsdóttir could become the nation’s next prime minister. The Pirate Party is currently polling at 42%, remaining the top party in the country for the past year now. Support for the party exceeds that of both parties in the ruling coalition combined. These results come from a new poll conducted by Stöð 2 and Fréttablaðið, where the Pirates have polled at over 30% for the past 12 months. At the same time, support for the Independence Party is now at 23.2%, which is a record low for the party for this poll. Their partners in the ruling coalition, the Progressive Party, are currently slightly above 10%. This puts support for the Pirates alone almost 10% greater than that of both parties in the coalition. So what would this remarkable activist do in office? Stubbornly, Birgitta follows the Pirate Party guidelines: horizontal leadership, power rotation, liquid democracy. She votes in Parliament according to the majority will collected on the Píratar web platform. Birgitta is a captain with no title or privileges. Yet she leads. Birgitta isn’t a rebel but a hacker. Complaining and pointing fingers is a waste of time. She has a goal, a plan: Birgitta wants democracy to work again. Being in charge is the price to pay. Yet she imposes her conditions: She wants her hands free. If in power, Birgitta’s action plan is clear: apply the new constitution; implement IMMI to make Iceland a safe haven for freedom of expression and data; hold a proper debate on joining the European Union, followed by a referendum; conduct a six-month policy assessment of every ministry; and turn the recommendation into a government plan. After that, Birgitta would step down to force new elections to have this plan supported across the board. A true pirate, she would leave her seat as soon as she is done. Power destroys souls. It has worn her out already. So what does she believe? We suspect life is about to get very interesting in Iceland. Her blog is here, she also posts on Facebook and on Twitter. You know, the one in which a few small powers reject the overwhelming votes in their favor from a vast majority of the world’s nations. WikiLeaks founder Julian Assange said Friday he felt vindicated by the findings of a United Nations panel that ruled he should be allowed to walk free. The UK foreign secretary has branded as “ridiculous” a UN panel’s ruling that Julian Assange be allowed to go free, as the Wikileaks founder demanded the decision be respected.